For the first time ever, the Grand Prix for Film has gone not to a TV ad, but to a captivating, interactive online video for Philips. This video simulates the exploration of a 3d scene. I wonder if in the future we would be able to create 3d maps merging information and images, distributing the knowledge into a virtual space. French philosopher Henri Bergson has a famous quote: "The eye sees only what the mind is prepared to comprehend." Bergson probably meant it metaphorically, but it seems to be literally true according to research by psychologist Martin Rolfs and colleagues. Rolfs studies the role of rapid eye movements in visual perception. Concept mapping and mind mapping are powerful graphic organizers, strategies for organizing and representing knowledge. They were developed during the seventies. The terms may seem to be interchangeable, but there are some differences in the way they are created and used. On the map above we can see some key differences and similarities between these two techniques. In my Opinion, Concept Mapping is rather leveraging logical thinking while Mind Mapping improves the balance between creativity and logical thinking. Both techniques are complementary and help you to develop various skills such as identification of key concepts, pattern recognition, ideas organization, context understanding, etc... Both techniques belongs to the field of Visual Mapping. In the video below, Karen Rohrbauck Stout at Western Washington University explains how she uses concept mapping as an assessment technique. Despite XMind is not a software exclusively dedicated to Concept Mapping like CmapTools, it can be very useful for building rapidly Concept Maps. 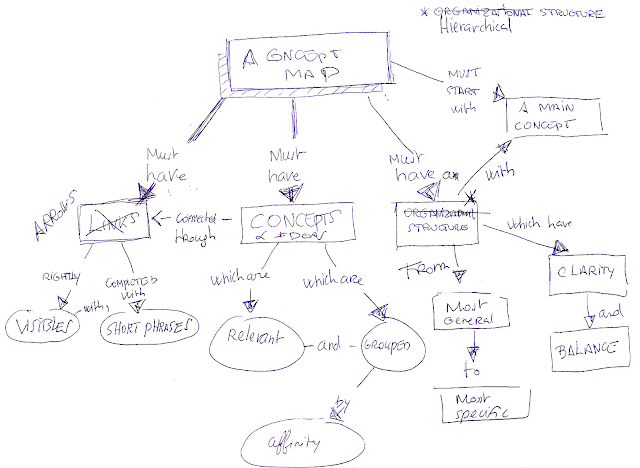 Here are the 5 steps in recommend to follow in order to create a Concept Map using XMind. 1. First StepIn my opinion, the first step should consist in sketching manually a map or a list of the key ideas and concepts. This gives you the opportunity to organize your thoughts and explore various possibilities. 2. Second stepOpen a new blank map on XMind and write the main concept of your map into the central topic.